It has taken each PuG I ran with multiple attempts to down this boss. I have seen more than a few members of my group quit the group in frustration because of him. In the rest of the bosses are tough too. They require reflexes to dodge the telegraphs, a tank that can soak up damage and maintain aggro while dodging and a healer that has to be ready to dodge telegraphs while healing players that are spaced all around him. The DPS also have a tough time because they have to dodge all the telegraphs while maintaining their DPS and being mindful of exactly where their healer is to get heals. Now, these observations have all been with pickup groups. I am certain that the dungeons are much easier with a guild group. However, when compared to the first dungeon in current WoW or Rift, there is no denying the difference in difficulty. Last time I played WoW, I leveled a new character and did most of the dungeons up to level 64 or so. Not a single one of them was a challenge to the degree the first dungeon in Wildstar is. All were run in pickup groups and many had players new to the game in my group. The simply did not present the level of challenge Stormtalon currently has. Now this has had many consequences on the Wildstar player base. Many have either quit or given up on dungeons in frustration. There are many topics on the official forums complaining about the difficulty. A lot of players are not happy with this. They are simply too used to the faceroll dungeons you see in most modern MMOs. Its like a culture shock to them. But, for me and many others, it has had the opposite effect. Yes, the dungeon is tough. Yes, I wiped a lot while doing it and it was, at times, frustrating. But the since of accomplishment I felt when that last boss went down was larger than any I have felt in a long time in MMOs. Certainly more than what I felt in any of the current WoW dungeons. Also, I noticed something else as a byproduct of the difficulty; my pickup group actually communicated with each other. In Rift and WoW, most PuGs are totally silent. The dungeons are not tough, so everyone goes in, facerolls the content and never says a word. This isn’t true in Wildstar. We talked strategy and, as a result, we actually got to know each other. This is how community is built. I understand those who don’t have the patience to PuG difficult content or don’t have the time. There are tons of MMOs out there for you. As for me, I hope Carbine stands their ground and keeps the difficulty level high. I like the challenge and I like the fact that it helps build community. That, in the end, is why I play MMOs. ← Still playing Wildstar. Still enjoying Wildstar. Reading about WildStar’s dungeons, the problem I have is not with the level of difficulty; it’s with the mechanics and the pacing. Everquest and DAOC had “difficult” dungeons in that any mob you might meet from the entrance inward was likely capable of wiping a level-appropriate party on its own. Dungeons were often huge and labyrinthine; it was very easy for a full party to get lost, be overwhelmed and wipe, leading to a a second expedition to get back to the same spot just to recover the corpses. They were “difficult” in terms of mechanics in that there was a lot of resource management required by both healers and dps (mana, endurance, even ammunition and reagents needed to be used judiciously because they could and often did run out) and in terms of tactics, because almost all fights required a set-up to ensure only as many mobs as the party could handle were in play. All of this took place at a pace that allowed conversation not just before the fights but during them. Conversation, that is, in text not over voice chat. The tension and excitement was immense but there was always time to think, to take in what was happening and even to crack a joke or two. What those dungeons rarely had were specific mechanics that needed to be countered in a specific way at a specific time. They allowed players to create and develop tactics on the fly, not learn a strict procedure and practice it to perfection. 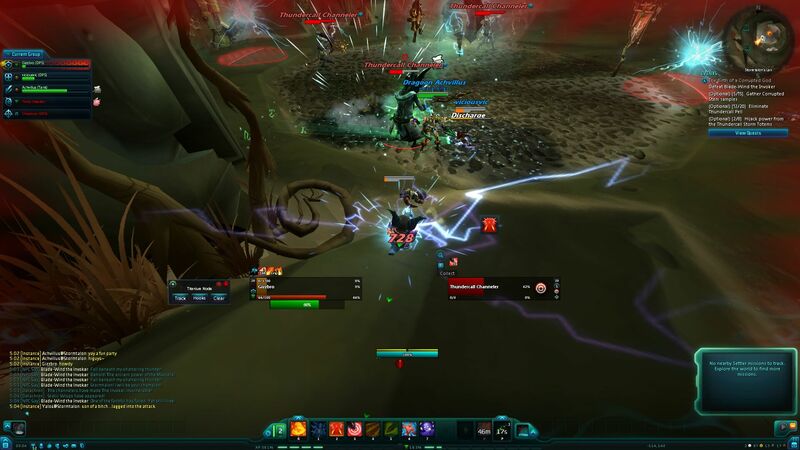 The WildStar method of adding difficulty seems to rely on the much, much faster pace of the modern MMO together with some very strict mechanical requirements and little room for error. That certainly is “difficult” but It doesn’t sound like fun to me. In fact, what it sounds like is the exact kind of mechanics that began to be introduced into those old-school MMOs just about the time I began to lose interest in running dungeons there. Not coincidentally, either. I’d really like a new MMO that offered “difficult” dungeons where the difficulty was simply that the mobs were really tough and the dungeons really scary, not that the dance steps were really demanding and the music really fast. That said, I haven’t experienced a WildStar dungeon for myself so I am prepared to be proved wrong if I ever try one. Stormtalon’s Lair (I can’t speak to the other dungeons as I have not done them) is certainly not difficult in the way you suggest or want, Bhagpuss. Stormtalon is pretty much a long cavern with a few larger rooms so there is no danger of getting lost. It is difficult in terms of resource management at times, as we had the healer run out of focus a few times during some of the boss fights. As a PuG, we developed almost all our tactics and strategies on the fly. During the fight, there was no time to communicate via type as we were all tremendously busy just surviving and doing our jobs. When in a guild group, I would imagine that voice chat would be very important. Healers heals are aimed and not tab-targeted, thus facilitating the need for party members to be in a good position for the healer to target. I would love to see more labyrinthine dungeons in Wildstar. UBRS/LBRS and Blackrock Depths were among my favorite dungeons in WoW. I much prefer that style to the long hallway and a couple of rooms of modern MMOs. 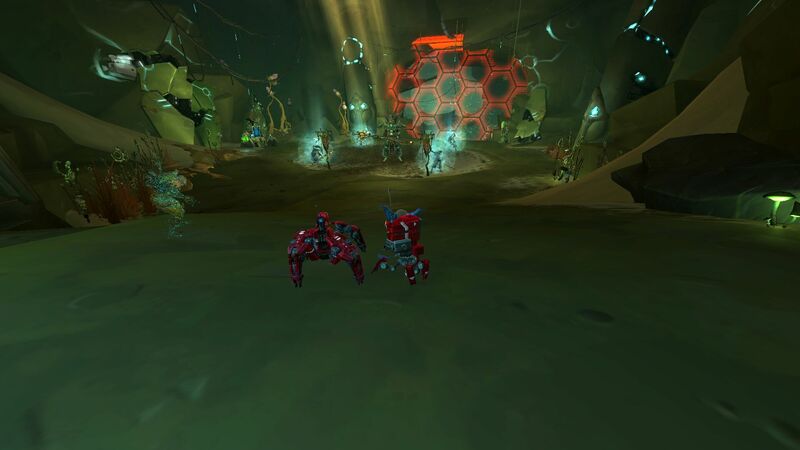 Hopefully either one of the dungeons in Wildstar are like that or they are going to add one. 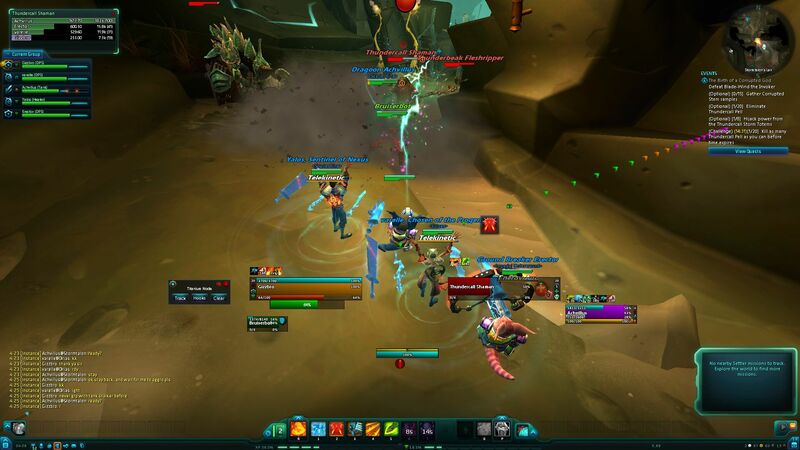 At its heart, Wildstar is an action MMO for all the good and bad that entails. If you don’t like the fast pace of the action style combat, then you are probably not going to enjoy Wildstar. I am tired of tab-target combat, so Wildstar is a nice change of pace but it is not for everyone.